Andy Baio recently wrote a post about a line chart that had accompanied some research from Netflix about the streaming video performance across various ISPs. The chart was ostensibly informative, but due to the colors that they chose for each line, it ended up being nearly useless for people with red-green colorblindness. Andy went on to create a more colorblind-safe version of the chart, but what I found even more interesting is that he closed his post with an anecdote relating his interactions with the Snopes folks. (Snopes, if you’re not familiar with it, is a popular site that fact-checks various urban legends.) As it would happen, Snopes’ category pages—in which they summarize the “True” / “Not True” status of each item in that category—was making use of shades of red (“false”) and green (“true”) spheres that weren't all that accessible. In fact, for someone with red-green colorblindness (which affects around 5–8% of all men), the colors were virtually indistinguishable. If we take a closer look at the numbers relating to colorblindness, that 5–8% means that between 1 in 20 and 1 in 12 men will have difficulty using Snopes.com. By way of analogy, around 1.6 million Americans use wheelchairs. While that may be ½% of the US population, the public has every expectation that businesses will help accommodate persons with wheelchairs through the use of wheelchair ramps and the like. And rightly so. (It’s also the law.) Whether one’s eyes, limbs, or other parts of one’s body, disabilities can affect all of us. That’s why I was so astounded when I learned that the people behind Snopes had no interest in the assistance that was offered to them. After giving it some thought, I decided to see if I could help fix this. So, after first checking with Andy to ask whether I could make use of the revised images that he had created, I wrote up a Userstyle for Stylish to automagically replace Snopes’ inaccessible images with Andy’s improved versions. If you’re not familiar with the Stylish, you can think of it along the lines of Greasemonkey but for CSS. Put another way, Stylish can automagically insert CSS into a page whenever you visit a particular site. It’s available for both Firefox and Chrome. Once you have Stylish installed, the only remaining step is to visit the page for the Snopes Colorblindness Accessibility userstyle and click the “Install with Stylish” button. First, you’ll need to install the User CSS extension (which is basically a clone of Stylish). Then, once you’ve restarted your browser, you should see a toolbar button with an “A” near your forward/back buttons—click that; that’ll load the editing screen for User CSS. Styles — Load this special version of the userstyle in a new tab and copy-n-paste all of that into the “Styles” field. Lastly, click “Save” and that should be it. Though I was disappointed by Snopes’ nonchalance toward accessibility, I feel I should mention that I continue to trust their fact-checking. They’re pretty good at that. Getting Strikethrough Text in Adobe Fireworks CS3? 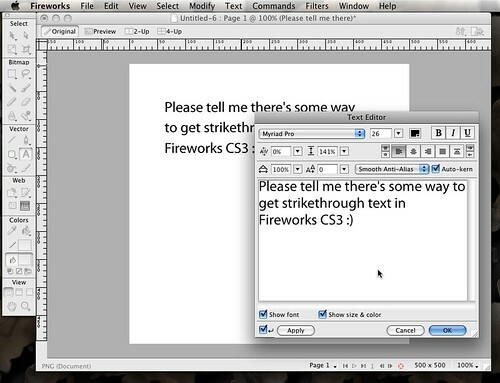 By chance, does anyone know how to get strikethrough text in Fireworks CS3? You’d think it’d be built right in — and I have no reason to believe otherwise — but I just can’t seem to find that option. I know that’s it’s possible in Photoshop (and Illustrator), so it’d make sense that it’d be in Fireworks too, no? If you’ve upgraded to Leopard but still need to test a site in an older versions of Safari, you can do so through Multi-Safari. Much along the lines of the stand-alone versions of IE that are out there, these packages allow you to run older versions of Safari. Interestingly enough, though Multi-Safari worked fine under the retail version of Leopard, it stopped working under OS X 10.5.1, offering the error “You cannot use the application ‘Safari 2.0.4’ with this version of Mac OS X.”. Fortunately, the maintainer of the Multi-Safari project, Michel Fortin, looked into it; and, within his blog entry describing the issue, some of the commenters chimed in with their own suggestions. In particular, Thomas Aylott deduced that “Apple has specifically blocked all versions of Safari < 3 from running on Leopard 10.5.1” (d’oh! ), but figured out a workaround by tweaking some of the package internals. To Thomas’ credit, he also compiled a fixed-and-ready-to-download version of Safari 2.0.4. I’ve tried it on my own machine and it works great. A group of 10 male college students who started out as non-gamers and then received 30 hours of training on first-person action video games showed a substantial increase in their ability to see objects accurately in a cluttered space, compared to 10 non-gamers given the same test, said Daphne Bevelier of the University of Rochester. I think this may be just the motivation I need to play Doom 3 more often — it’s for my own good, right? ;). To be sure, the $100 savings isn’t the same across the product line — for instance, Office upgrades get a $50 rebate while academic versions get a $15 rebate. In any case, NewEgg has Office 2004 for Mac for $249; with an after-rebate price of $149, that’s not too bad. Then again, NewEgg also has the OEM version of Office 2004 for Mac for $184, so that may be an option if you miss out on the rebate but you're still looking to buy Office.